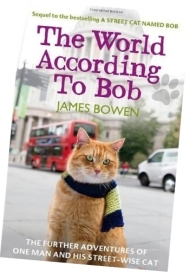 The novel “A Street Cat Named Bob” tells the story of how London busker James Bowen’s life was turned around by the unexpected arrival of Bob, the streetwise ginger cat. This remarkable novel sat at the top of the Sunday Times bestseller list for well over a year… and the sequel “The World According To Bob” will be released at the start of the month. The book documents the continuing tale of their life together, and James highlights the many ways in which Bob has been his protector and guardian angel through times of illness, hardship, and even life-threatening danger. Followers of the story of James and Bob will no doubt be keen to get their hands (and paws) on a copy of this new book, and Southenders get the chance to meet the bestselling duo and pick up a signed copy of the book, courtesy of the Southend-on-Sea Waterstones bookstore. 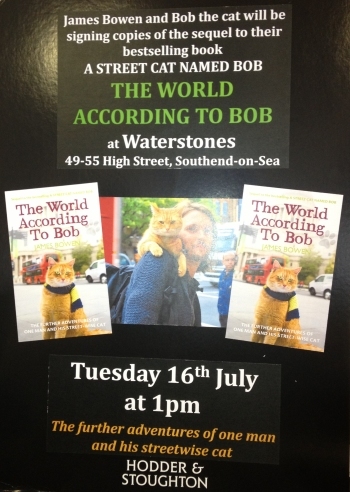 The chance to meet James Bowen and Street Cat Bob happens on Tuesday the 16th of July 2013 at Waterstones, 49 High Street Southend from 1pm. We’ve been told that Bob enjoys coming along to book signings, but isn’t too keen on flash photography. He does however, like a stroke, and isn’t daunted by the crowds that accompany his public appearances, so if you’re a fan of the first book, come along and shake a paw with James and Bob later this month. Staff at Waterstones advice that you arrive early to avoid disappointment.